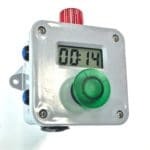 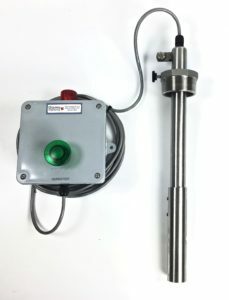 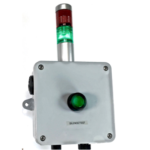 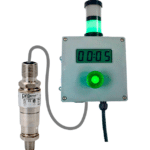 This is an example of our battery-powerd Intrinsically Safe alarm box IS-AB connected to a stainless steel float switch probe by a length of communications cable so the shutoff box can be at ground level while the level switch is on the top of a tall tank. 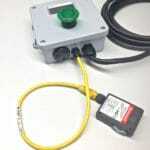 This unit has a removable float guard to protect the float switch from damage when transferring to different tanks. 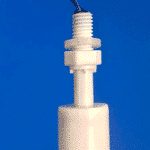 Float guard is secured to the pipe with 1/4-20 set screws. 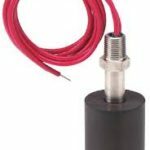 The level switch mounts to the tank with a 2 inch NPT stainless steel pipe plug and the depth can be adjusted by loosening the thumbscrew.